A people person, who will commit to a long term role at the sanctuary, has the ability to recall information and interact comfortably with visitors of all nationalities. 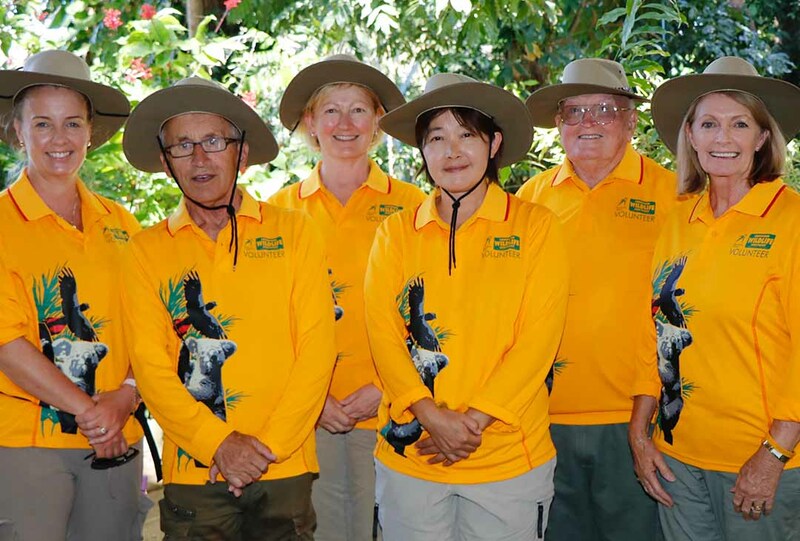 National Trust Currumbin Wildlife Sanctuary’s Park Volunteers play a key part of daily Sanctuary operations and in making our guests feel welcome. Park volunteers are stationed throughout the Sanctuary and are involved with greeting our guests of all nationalities, answering questions about our animals and attractions, helping guests to locate shows and facilities, and helping our guests to get the maximum enjoyment out of their day. We are looking for individuals with a happy disposition who are passionate about customer care, who love talking about animals, and who are committed to providing an unforgettable customer experience. The person who undertakes this role must work well independently and in a team environment, and have exceptional interpersonal skills. Volunteer uniform shirt, a broad brim hat, name badge, and printed training and reference materials. A full National Trust Membership valued at $65. Free or discounted admission to hundreds of properties in Australia and overseas through our network of affiliated trusts. Excellent interpersonal communication skills including problem solving and conflict resolution. Please familiarise yourself with the requirements we expect of our volunteers and then follow the process to complete your online application for a Volunteer position with National Trust of Australia (Qld) Currumbin Wildlife Sanctuary. There is a 3-part application process. Once you have completed your online application, it will be forwarded to our recruitment partners at Volunteering Services Australia. Once received, they will phone you to come in to their office to learn more about our program. After you have met with Volunteering Services Australia and they feel the position is suitable for you, you will then be invited to visit National Trust Currumbin Wildlife Sanctuary to meet with one of our current volunteers, who will give you detailed information about the program and discuss your ability to fulfil the requirements of the role. We want to do our best to ensure you are happy in your role and enjoy your time volunteering with us. If you are successful, arrangements will be made for you to participate in a trial shift, so you can try out the role first hand before committing to the training program. After successfully completing an interview and walk around, you will be invited to attend a trial shift. You will be buddied up with one of our long term volunteers who will take you on their shift for the afternoon. Having this experience is a wonderful opportunity to establish whether this volunteering position is suitable for you. Once you have done a trial shift and both parties are happy, the next step is to complete a 3 day volunteer training course. (This training course covers 3 days of job relevant practical training and sessions). We require that Park Volunteers complete the full training course. The training course is designed to provide you with extensive information about our animals and facilities at the Sanctuary, allowing new Volunteers to confidently assist our visitors. The course is conducted from 8.00 am to 3.00 pm for 3 days. It will be necessary to have 6 weeks availability following the training course to complete your “on the job” training and assessment. After successful completion of the Park Volunteer Training Course, you will be taken under the wing of a long-term volunteer to complete your 6 weeks “on the job” training. Once you have completed this training, you will graduate as a fully fledged Park Volunteer! Please note: Our volunteer programs are currently not open to international visitors. Places within the Park Volunteer program are limited and no guarantee of acceptance will be given. 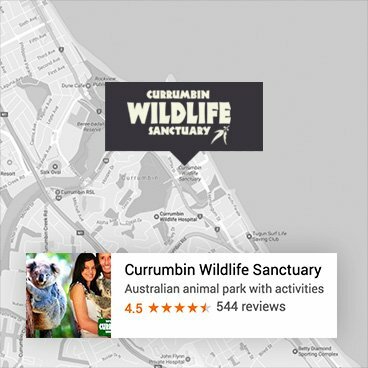 Thank you for understanding that in order to protect both our animals and Sanctuary operations, only people who complete the selection and training program requirements can be accepted into the Currumbin Wildlife Sanctuary Volunteer programs. This suitability will be assessed over the training and probation period. If the decision is made by Currumbin Wildlife Sanctuary that a trainee volunteer is not a good match for the requirements of the program within the first eight weeks, the course fee will be refunded in full upon return of hat, shirt, badge and other materials issued.